When middle aged mom and college dropout, Deanna (Melissa McCarthy), finds out her husband of 20+ years wants a divorce, she begins to take stock in her own life. Disappointed, Deanna decides to go back to college to finish her degree in archeology, trouble is, that means she’ll be going to school along side her own daughter, Maddie (Molly Gordon), only slightly awkward. Making matters better but also more awkward, Deanna is taken in by Maddie’s sorority sisters, resulting in a middle aged awakening for the ages, and what about this young buck that seems love stricken, Jack (Luke Benward)? Directed by Ben Falcone and written by Falcone and Melissa McCarthy, this spirited comedy aims high but instead has more valleys than peaks offering little in terms of creativity and originality. While situationally fun in spurts and offering up plenty of charm, the film telegraphs its entire arc in a predictable manner without really stirring the pot or inspiring the viewer. Collectively, the ensemble does their best with the material before them, but again it’s lack of story that proves to be too insurmountable to overcome, benign in its existence thankfully the film comes in sparingly short with a runtime of an hour and forty five minutes. Perhaps consider treating mom to something else this weekend and maybe catch this later on re-run….or not. 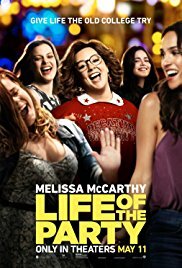 Life of the Party is rated PG-13.